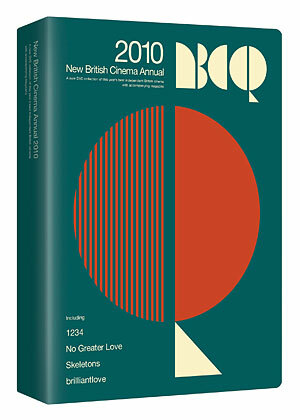 The New British Cinema Quarterly program is first and foremost a touring screening series, where four films are chosen from either the London or Edinburgh Film Festivals and shown at independent cinemas all over the UK. But they have also produced this lovely DVD box set of the first four films in the program, and included a gorgeous mini-magazine, designed by the same folks who put together Little White Lies. In addition to introductions and behind-the-scenes material on all four films, the magazine contains articles on “The Future of British Film” along with an article featuring reactions from young British filmmakers to the news that the UK Film Council is being shuttered. As long as you have a region-free DVD player, this is an excellent way to see what’s going on in British independent film. No Greater Love (Director: Michael Whyte): a documentary featuring the nuns of a convent in Notting Hill. Skeletons (Director: Nick Whitfield): two itinerant exorcists literally remove the skeletons from people’s closets. brilliantlove (Director: Ashley Horner): intimacy and betrayal in a long, hot summer romance. * I know that I’ve used the terms British, UK, and England seemingly interchangeably, but I am aware of the differences. England is one country, Britain usually describes the entity that is England and Wales, and the UK adds Scotland and Northern Ireland to the gang. This entry was posted in DVD and tagged nbcq, uk. Bookmark the permalink.